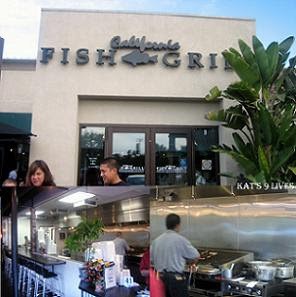 I have been meaning to come to the California Fish Grill because a lot of people rave about it. Finally I decided to come here with Lil Bel to hang out. We were there early on Saturday so there were plenty of seats open. This is your typical order and find a table by yourself to wait for the food. They have a small and simple menu to choose from. It's basically a self-serve place. They have a sauce bar where you can choose what condiment you would like to go with your meal. 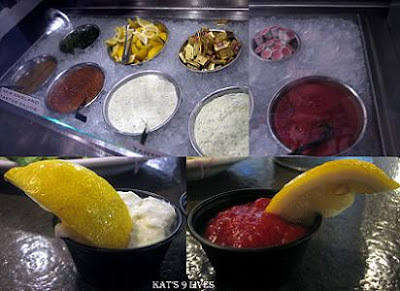 I chose Tartar and Cocktail sauce with slices of Lemon to go with my meal. Unfortunately I chose the wrong dish. Fried Shrimp just popped out at me and I wanted to see how good their batter is. Sadly, it was a huge disappointment and a waste of money. The shrimp and batter had no flavor. I was disappointed by the portion size as well. Being greedy as usual, I ordered the Cajun Salmon Taco Since it's my first time here and I wanted to try as much as I can, I opted for a taco. The Cajun seasoning was not good and tasted funky. I felt the salmon was overcooked and dry. If it were some other fish this might have tasted better. Lil Bel picked the right dish. She ordered the Grilled Mahi Mahi with Garlic Butter. The fish was fresh and nicely grilled. One half was more tender than the other side because of the way they cut the piece. In comparison to my dish this was great! lol She raved about the Fries and I thought that she was a little odd since mine was only blah and bland. I knew it must have been the sauce from the fish that drizzled onto the fries. Her dish was simple and good. All in all the food had its ups and downs. The service was not really existent since you do everything yourself and they forgot my taco. I think I would come back to get regular grilled fish but definitely not anything Cajun or fried! Avoid those! It's all dependent on what you order. I can see why some people might really like this place, but that must be because they chose wisely. hmm how come all these restaurants stick the word california in their name? does it make the food taste better? or do people in california just forget what state they're in when they go out to eat?